Over 30,000 young women and men enter the labour market each day in India, and the economy generates employment for less than half of this rapidly expanding workforce. In this race for jobs, only a small fraction finds formal sector employment, leaving more than 80 per cent in the informal sector – many of them either in disguised underemployment or open unemployment. It is estimated that in order to address this challenge, India will need to create decent work opportunities for 15 million people, each year, for the next 15 years. Micro enterprises play an instrumental role in this transition, as they create local jobs in large numbers. Employing 80 million of India’s workforce, any impetus to this sector will have significant multiplier effects on economic resilience and social well-being. Further, small businesses also have the ability to adopt innovations and replicate them at scale. The growth of these enterprises in emerging economies is, however, limited owing to the lack of support services and an ecosystem that is conducive to and nurtures their development. Evidence from initiatives of the Development Alternatives Group indicates that only 1 out 15 entrepreneurs are able to access formal credit, while 85 per cent of these entrepreneurs are constrained by poor access to market channels. Less than 5 per cent of potential entrepreneurs know about non-traditional enterprises that can be established in fast-changing urban and rural markets. Such lack of information becomes an impediment to unlocking the entrepreneurial spirit. Keeping in mind the inaccessibility of these services on-ground, the increased need for innovation in the support services ecosystem cannot be emphasised enough. The existing informal lending mechanisms through money lenders have exorbitant interest rates, making them unviable. 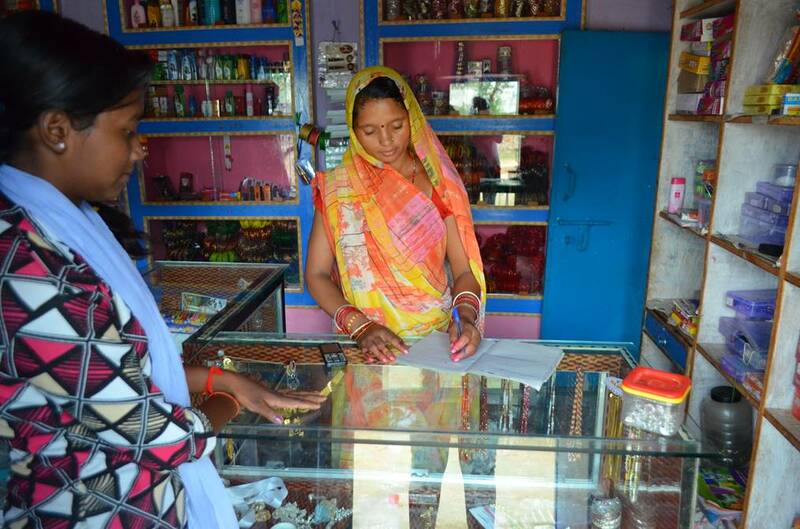 Alternative channels for accessing credit facilities are women self-help groups and supporting umbrella organisations developed under various public-sector initiatives. These groups encourage pooling of savings to create a corpus for inter loaning within members for personal and productive use. These are often not too mature to provide high value credit – making their access limited. The W4P programme will nurture two existing community umbrella institutions run by women to provide bridge finance facility to micro entrepreneurs. The facility supports credit amounts from INR 20,000 – 35,000 on the basis of assessment of the business model and risk associated with the enterprise. A thorough assessment and process protocol is followed to ensure transparency and compliance. The credit services will reach out to 40 entrepreneurs through the programme. Moving forward in acceleration, the programme will explore the possibility of nurturing these groups as micro finance service providers. A host of public and private institutions provide finance for personal consumption and productive use. Despite their high rate of interest (~20 % p.a. ), these remain popular, as the application and documentation process is less cumbersome than formal lending processes. These remain limited for business use due to stringent recovery processes and small pocket size loans. In order to leverage the network of micro finance institutions, the programme is working closely with 20 entrepreneurs as a group to help secure loans of higher pocket size, granting flexibility over payback period for micro enterprise development. The prototype will help us identify mechanisms for partnerships in the acceleration phase. Communities are unable to access existing funds due to the absence of bankable business plans and high cost of access owing to bureaucratic delays. Banks and supporting institutions are unable to identify “right” and reliable borrowers. Lack of trust between the providers of the finance and the entrepreneurs further renders the system weak. In order to address this environment, W4P will help the communities build application and business plans. It will also work closely with the stakeholders associated with such schemes to ensure that an environment of trust is built in the community. The aim is to link 10 entrepreneurs in the MUDRA Scheme for loans amounting to INR 50,000, and five entrepreneurs through schemes of the Ministry of Micro, Small and Medium Enterprises. These services are routed through state, regional and district lead banks. This will promote an environment where communities are familiarised with the banking processes. The banks, on the other hand, will be linked with strong and performing entrepreneurs, enhancing their confidence with micro businesses. Strategic engagements at the level of the community and institutions shall allow for strengthening the ability of local entrepreneurs and individuals to access finance with ease. Enabling access to finance is further significant in that it opens up an avenue of opportunities for people with a concrete sense of achievability. Setting up these credit lines can enhance their presence within the formalised sector – providing linkages and benefits which otherwise remain beyond the ambit of the rural informal sector. These initiatives are also strategically positioned in a way that brings marginalised low-income communities into the ambit of formal financing. Acknowledging the limitations of communities that either do not have capital, or are unable to access it, a social innovation methodology seeks to promote such initiatives that are able to carry the rural forward while including everyone in its folds.